Even fleeting comments can provide great blog fodder. Now don’t get me wrong – I like cereal. I like it for breakfast, as a snack (no milk denotes “snack” status), or as a quick meal when I’m pushed for time, out of groceries, or just plain lazy. But when I put too much thought into it, lots of things about cereal strike me as very similar to commercial, dry pet food. Is this photo of pet food or cereal? The first obvious similarities are the physical properties kibble and cereal share. They’re both processed, mass-produced dry foods that come conveniently bite-sized. We put milk on cereal, and many people put water on their dogs’ kibble before serving. Both cereal and kibble provide quick and easy meals, can be purchased in bulk, and unused portions keep and store well. And both kibble and cereal are marketed to any specialty purchaser in a variety of price ranges. Looking for a whole grain cereal? They’ve got that. 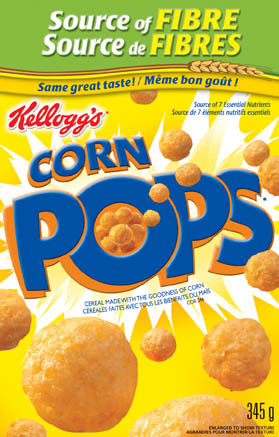 Looking for a low-fat or low-calorie cereal to accommodate your diet? They’ve got that, too. Looking for a kibble “designed” specially for your dog’s breed, age or size? Options abound! And what about nutritional value? A lot of our favourite cereals are “part of a complete breakfast”, right? With lots of essential nutrients and whole grains? Well, this website informs us that many of our trusted brands are not what they seem. General Mills Apple Cinnamon Cheerios, a personal favourite, is reportedly 42% sugar – but what about all those whole grains? Do they count for nothing?! I can’t say this revelation will mean I’ll cease buying it immediately, but I’ll consider cutting back. And what about those dog foods with pictures of meat on the packaging? 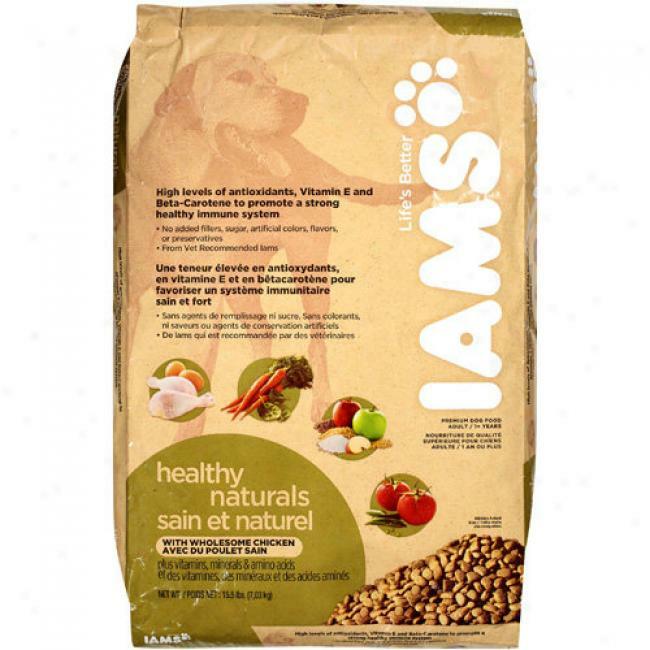 Well, even though the first ingredient of Iams Healthy Naturals is actually chicken, the inclusion of water content for the portion analysis means that after processing upwards of 80% of the volume is lost and it would no longer remain the main ingredient. And the second ingredient is chicken by-product, which certainly doesn’t include those delicious-looking drumsticks. The following ingredients listed by volume are rice, corn meal, whole grains, and barley. What about all that promised meat and protein? Which brings me to my final similarity between cereal and kibble: the ingredients. Corn Meal, Chicken By-Product Meal, Ground Whole Grain Sorghum, Dried Beet Pulp, Chicken, Dried Egg Product, Chicken Fat, Ground Whole Grain Barley, Chicken Flavor, Potassium Chloride, Brewers Dried Yeast, Salt, Flax Meal, Calcium Carbonate, Vitamins (Vitamin E Supplement, Beta-Carotene, Ascorbic Acid, Vitamin A Acetate, Calcium Pantothenate, Biotin, Vitamin B12 Supplement, Thiamine Mononitrate (source of vitamin B1), Niacin, Riboflavin Supplement (source of vitamin B2), Inositol, Pyridoxine Hydrochloride (source of vitamin B6), Vitamin D3 Supplement, Folic Acid), Sodium Hexametaphosphate, Caramel, Fish Oil (preserved with mixed Tocopherols, a source of Vitamin E), Minerals (Ferrous Sulfate, Zinc Oxide, Manganese Sulfate, Copper Sulfate, Manganous Oxide, Potassium Iodide, Cobalt Carbonate), Choline Chloride, DL-Methionine, L-Carnitine, Rosemary Extract. Corn meal, sugar/glucose-fructose, corn bran, fancy molasses, salt, oat flour, baking soda, colour, vitamins (niacinamide, d-calcium pantothenate, thiamine hydrochloride, pyridoxine hydrochloride, folic acid), minerals (iron, zinc oxide). BHT added to package material to maintain product freshness. I put in bold above all of the duplicate ingredients between the two products. Take out anything in kibble intended to represent meat and the two are quite similar, are they not? What does this say about kibble? Or about cereal? 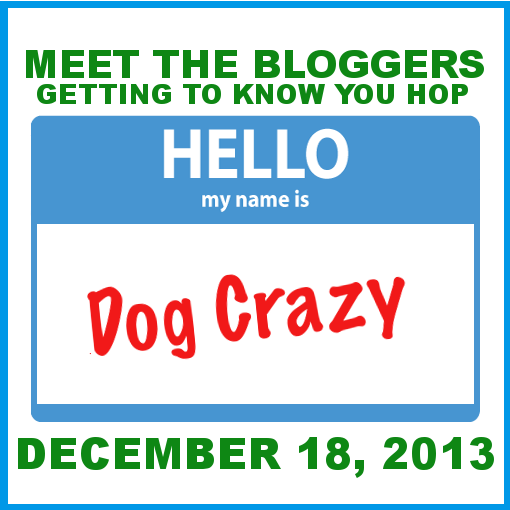 Blogging about diet almost seems to be a rite of passage for those who focus on dog-related topics. Every dog blogger does it eventually, and they do it with vigour and enthusiasm. It solidifies your status as “that kind” of dog person. And now it’s my turn. Perhaps the enthusiasm stems from the notion that feeding your dog a raw diet is controversial and ground-breaking. I disagree. On the surface maybe it does seem somewhat controversial because raw-feeders appear to be the minority, but dig just a little deeper and the whole thing – to me at least – seems pretty obvious. The soapbox issue here is pet owner education (or the lack thereof). The reasons behind feeding your dog a raw diet are pretty straightforward. Dogs are primarily meat-eaters and therefore should be fed meat. Thus, raw food is good for your dog; grain-based kibble is not. In fact, the commercial kibbles are so bad that they are responsible for most pet allergies (due to the wheat and soy ingredients), periodontal disease, skin issues, and even some behavioural problems. It makes sense – these kinds of things can happen to an animal when fed an insufficient diet. So why the debate? Well, giving pet owners the benefit of the doubt and assuming everyone wants the best for their animals, it must be that people just aren’t aware of this or don’t read ingredients labels. Someone has to be buying the big name grain-based foods for their pets or the folks selling them wouldn’t be in business. Unfortunately, those selling poor-quality, mass-produced, grain-based kibble appear to dominate the market. Their frequent, high-budget, cutesy commercials and print ads can be found nearly everywhere, and their products are sold in pretty much every big name grocery and pet store. They speak to your love for all things furry and tell you “if you love your dog (or cat), you will feed them [insert brand here], because we love them too and only want to give them the best”. They’re lying, of course. Considering over one-third of Canadian and American households have a pet dog, there is a large market for pet food, and these companies exist to turn a profit. And they certainly don’t do so by filling their foods with the quality ingredients your dogs and cats should be eating. 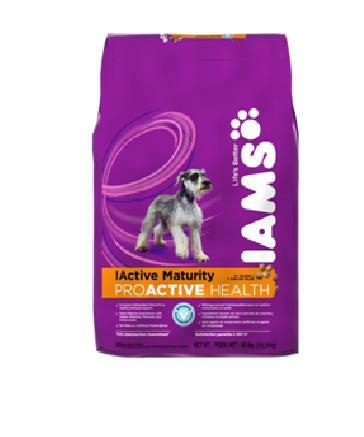 This, of course, has resulted in many pet food recalls in recent years, such as the infamous 2007 Menu Foods recall that involved dog food sold under 53 different brands and cat food sold under 42 different brands, including the familiar labels Iams and Eukanuba. But marketing dominance is not the only problem. The lack of education does not only plague the average pet owner, but also the person they often turn to for advice: our trustworthy neighbourhood veterinarians. The majority of vets are insufficiently educated about nutrition. There. I said it. Firstly, this is because the average veterinary degree only requires that 40 hours/one week of study be dedicated to the subject of nutrition generally, out of a total three years of schooling. Secondly, I did a quick search on companies that sponsor many nutrition education programs for vets in North America, and guess what names came up. Hill’s. Purina. Great, so our “experts” are taught by the bad guys. Before you write this off as the least interesting conspiracy theory ever, think for a second: what brand is often found on your vet’s shelves? Hill’s Science Diet, of course. Using my favourite website on this issue, www.dogfoodanalysis.com, take a look at the breakdown of Hill’s Science Diet Canine Maintenance Beef and Rice. The analysis gives this food the lowest possible rating. Its sole meat ingredient (beef) isn’t properly accounted for because they’ve included water content in the weight which is removed as it’s made into kibble. The next three ingredients by volume are grains: brewers rice (low quality by-product); rice flour (grain fragment, filler); and corn meal (difficult for dogs to digest and thought to be the cause of allergies and yeast infections). Tell me, when exactly was the last time you saw a wolf or dog (or cat) down a cob of corn in the wild? The next two ingredients are soybean meal (low quality protein, cause of canine allergy problems) and chicken by-product meal (by-products are low-quality unidentified meats, usually rejects from human food processing that could not be used elsewhere). The several remaining ingredients are more unidentified by-products, beet pulp (cheap filler, thought to be responsible for allergies and kidney and liver problems), and chemical preservatives (possibly carcinogenic). So why does the vet sell or promote this junk food? Either they don’t know any better, or they do but would rather profit from sales-based incentives from selling the food and getting business from ailments that plague our pets as a result of the food. Ahh, the old debate of ignorance v. malevolence. I’ll pick ignorance as the perpetrator, because I really don’t (want to) think most vets are inherently evil (although Blofeld did have that cat…). It’s simple. Look at the ingredients in the kibble analysed above. Why would you feed that stuff to your pet? Dogs and cats are biologically carnivores. Consider their teeth, jaw and neck muscles, stomachs, colons and other internal organs – they are anatomically designed to be the eaters of raw meat. Because (some) humans have been feeding their pets grain-based kibble in recent decades does not change that, and just because they can “get by” on a sub-par diet doesn’t mean they should. You shouldn’t eat Doritos every day for dinner, either. My favourite fanciful objection to raw diets (I’ve even heard it cited by a vet), and one that misses the point entirely, argues wolves and dogs are actually omnivores, meaning their natural diet is made up of primarily both plants and animals. This often is supported by the suggestion that wolves eat the stomach contents of their prey – the prey having ingested a diet of primarily herbs and grains. Thus, the wolf is getting its necessary corn, wheat, or grain intake from the deer/rabbit/whatever’s stomach. And because your dog isn’t out there eating stomach contents, his everyday meal should be a kibble made of cheap corn and wheat. No, dogs and wolves are not omnivores. They are “facultative carnivores”, which means while they are primarily meat-eaters, they do occasionally eat a non-meat meal. Note the emphasis on occasionally, meaning that their diet should still consist primarily of meat, not corn or wheat. On the other hand, as a feline, your cat is an “obligate carnivore”, and a meat-only diet meets his nutritional requirements, and housecats actually lack the physiology necessary to effectively digest plants and vegetables. So not only is a raw or meat-based diet the best for Felix, too, this also means that grain-based kibbles can have an even more detrimental effect on your feline friends. So the topic sums up as follows: to feed your pet a diet most suited to his natural needs, and closest to what he would eat if left to his own devices, is to feed him a raw diet. It is more appropriate and healthier, and many pet owners report a variety of improvements in their pets once having switched to a raw diet, including better dental and digestive health, a reduction or even complete elimination of allergies, and better coat and skin health. And I should note that to feed your dog or cat a raw diet doesn’t mean you have to fill your deep freeze with an entire cow carcass (although you could if you wanted). There is a tonne of selection when it comes to raw diets, you just have to look. Sure, you can purchase your own raw meat in bulk and add fruits and vegetables at meal time, or there are many brands that offer convenient pre-packaged and prepared raw patties – fruit and veggies included. All you need to do is thaw the food and give it to your dog. It can be as simple or as involved as you want. Granted, the cost does increase when you switch your pet to a raw or otherwise quality diet, compared to feeding your dog cheap, commercial garbage kibble, but it’s a matter of proper diet and the overall health of your pet. The advantages are worth the expense, and so is your pet. And, of course, if you simply can’t stomach feeding a raw diet, there is a decent middle-ground compromise of high-quality kibble, which you can supplement with fish oil and the occasional raw bone or turkey neck, as you are willing or as is necessary. To find a suitable brand of food, simply examine the ingredients. Look for foods that include actual meat as the first ingredients: beef, bison, turkey, chicken, eggs, pork, salmon, etc. Potato is an acceptable ingredient and is a good source of carbohydrates. Ensure the food you select is void of grains, but look for fruit and vegetable ingredients (pumpkin, carrots, turnip, apples, etc. ), which do provide necessary nutrients alongside meat. And if you’re ever unsure or concerned about your pet’s diet, just think back to that ingenious Wendy’s ad campaign from the ‘80s and ask yourself: where’s the beef? Really? Daschund-specific kibble? Terrier-specific kibble? There’s a scam if I’ve ever seen one. If your cat is in the back yard eating grass, they’re probably just trying to induce vomiting. Hairball, anyone? Not corn, soy or wheat. Or visit www.dogfoodanalysis.com and look for brands given the highest (6 star) rating. Perusing some dog-related blogs this week, I stumbled upon this campaign. 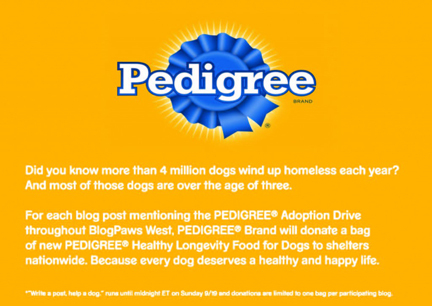 Blog about the campaign by Sunday, September 19, 2010, and Pedigree will donate a 20 lb bag of dog food to a shelter. “Like” them on Facebook and they’ll donate 8 oz. of dog food. Watch their video online, and they donate $1.00. Granted, the last two actions can be completed by anyone, and the Facebook campaign lasts all year. 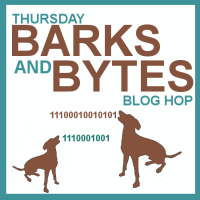 But as far as the blogging campaign goes, it is organized by BlogPaws, which is a Pedigree-sponsored organization, so I’m not sure if every blog by just anyone count or not – I tried to find some fine print, but still remain unclear. And you know what? I think I’m okay with the idea that this won’t count. Actually, I know I am. Yes, the advertised sentiment behind the Pedigree campaign is great. No one can argue that. Supporting shelters and adopting rescue dogs is an important cause. And Pedigree’s marketing department has amazing skill when pulling at the heart strings of animal lovers. Their impervious tagline is “PEDIGREE® Brand. Everything we do is for the love of dogs, from the nutritious dog food we make to the dog adoption drive we support.” Who could disagree with that? But before I decided to jump on board and declare my undying support for their campaign, I looked up the food they were donating, as the campaign also seems to serve as advertising for some of their new kibbles. 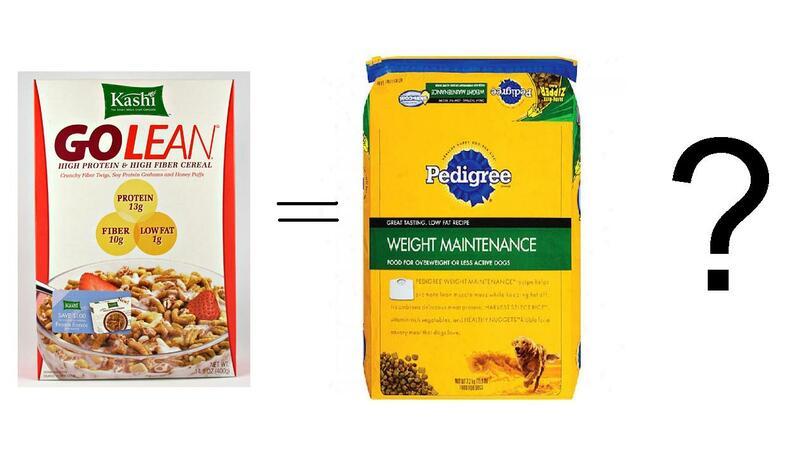 The dog food donated with our support is PEDIGREE® Healthy Longevity Food for Dogs. Sounds great, doesn’t it? Healthy. Longevity. Both things I want for my dog, don’t you? They go on to advertise the food includes “special nutrients” like antioxidants, fish oil, and Omega3s. That’s great! In fact, the spin is almost enough for me to compulsively “Like”… or is it? Pedigree is a well-known brand. We’ve all seen their commercials, and they have a wide range of products that you can find in most pet stores… and even grocery stores. Are alarm bells ringing yet? The ingredients of PEDIGREE® Healthy Longevity Food for Dogs are posted online (http://www.pedigree.com/really-good-food/product-page.aspx?id=1037). Ground Yellow Corn, Chicken By-Product Meal, Brewers Rice, Ground Whole Wheat, Corn Gluten Meal, Animal Fat (Preserved with BHA and Citric Acid), Lamb, Plain Dried Beet Pulp, Vegetable Oil (Source of Linoleic Acid), Natural Flavor, Salt, Potassium Chloride, Calcium Carbonate, Monocalcium Phosphate, Fish Oil (Preserved with Mixed Tocopherols, a Source of Vitamin E), Vitamins (dl-Alpha Tocopherol Acetate [Source of Vitamin E], Choline Chloride, L-Ascorbyl-2-Polyphosphate [Source of Vitamin C*], Vitamin A Acetate, Thiamine Mononitrate [Vitamin B1], Biotin, d-Calcium Pantothenate, Riboflavin Supplement [Vitamin B2], Vitamin D3 Supplement, Vitamin B12 Supplement), Dried Vegetables (Peas, Carrots), Minerals (Zinc, Sulfate, Zinc Proteinate, Copper Sulfate, Copper Proteinate, Manganese Proteinate, Potassium Iodide), Added FD&C Colors (Yellow 6, Yellow 5, Blue 2). *not required as an essential nutrient by The AAFCO Dog Food Nutrient Profiles. And we have officially entered the realm of dog food controversy. 25% protein? But isn’t my dog largely a meat-eater? Why do they want to give him corn? Or wheat? If left to his own devices in the wilderness, he certainly wouldn’t go devour the nearest farmer’s crop. Cons: Insufficient meat content, by-products, low quality grains, fat and meat products of unidentifiable origin, carcinogenic preservative, artificial colourant. This food receives a 1 star rating simply because there is nothing lower. The primary ingredients in the food are grains (it should be meat!). Corn is a problematic grain that is difficult for dogs to digest and thought to be the cause of a great many allergy and yeast infection problems. We prefer not to see this used in dog food. Meat and bone meal is a low quality meat product for which it is impossible to determine the source. Corn appears a second time as corn gluten meal. The AAFCO definition of corn gluten meal is “the dried residue from corn after the removal of the larger part of the starch and germ, and the separation of the bran by the process employed in the wet milling manufacture of corn starch or syrup, or by enzymatic treatment of the endosperm”. In plain English, that which remains after all the nutritious bits have been removed. Animal fat is a further low quality ingredient and is impossible to determine the source. Unidentified ingredients are usually very low quality. AAFCO define this as “obtained from the tissues of mammals and/or poultry in the commercial processes of rendering or extracting. It consists predominantly of glyceride esters of fatty acids and contains no additions of free fatty acids. If an antioxidant is used, the common name or names must be indicated, followed by the words “used as a preservative”. This food uses chemical preservatives (BHA, BHT) which is believed to be carcinogenic, and is banned from use in human food. It also uses artificial colourants. The 6th and 12th ingredients are fragments of wheat. The use of wheat is a significant negative: wheat is believed to be the number one cause of allergy problems in dog food. This is another ingredient we prefer not to see used at all in dog food. 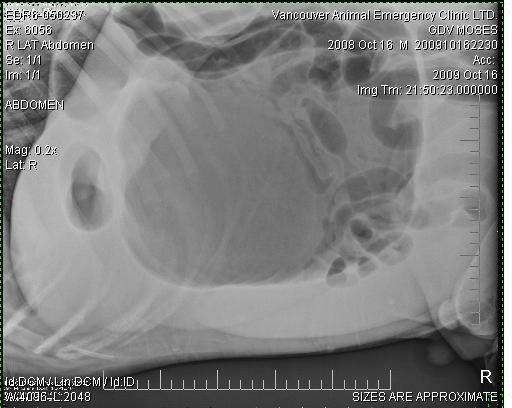 For more information on bad ingredients often found in commercial dog food, visit http://www.dogfoodproject.com/index.php?page=badingredients. Many of the ingredients in Pedigree kibble are listed. So, a very brief look into the ingredients and now we find that Pedigree is not so great after all. Sure, they use a lot of positive words, but this only redirects your attention to your own affection for your pet rather than the details of the product they’re selling you. I invite you to check out your own dog food against these sources, and the many other good resources out there. There is a plethora of information about dog food nutrition, and poor quality kibble recalls have been common occurrences in the recent years. There are many good quality options out when it comes to what to feed your dog, and what is actually good for them. Take a moment and look into raw diets and their many benefits, or if that’s just not an option for you, check out the brands given 6 star ratings by the Dog Food Analysis folks (Origen and Innova make that list along with a few others). So, should I support this campaign? The sentiment of helping rescue dogs still seems worthwhile, but the associated marketing and promoting of the Pedigree brand doesn’t sit well with me. And I imagine the shelters supported by this promotion receive a lot of financial help from Pedigree and therefore are obligated to promote it to the adopters of their rescue dogs. Do I want to see people feeding this food to dogs? Absolutely Not. On the other hand, is Pedigree food better than no food at all? Well… you got me there. Do I just wish our support guaranteed the donation of a good quality dog food? Of course, but I won’t hold my breath. Pedigree is out there to make money, you know. In the end, though, I’ve still blogged about the campaign, so perhaps they’ve bested me there. Touché, Pedigree, touché.